Florence, Italy, set in a valley and surrounded by rolling hills and mountains, is a treasure trove of things to discover. Within a five kilometer radius, that encompasses the historical center, visitors can see architecture, sculpture, paintings housed in historic buildings that are now museums, street markets, cafes, restaurants, and of course shops. Whether you wander down a little narrow side street or one of the main streets, there is always something new to see and discover. Indeed, it is no wonder that the city is filled with tourists. However, to save valuable time queuing, it is worth buying advance tickets to the places you really want to visit. If you don’t know where to start, just ask your hotel because they can not only make recommendations, but also book for you. Alternatively, buy a Firenze Card, which gives you admission to all major museums in Florence over a 72 hour period. At the top of your must-see list should be the 16th-century Uffizi Gallery which was originally a palace and the offices of the Medici Family, who once ruled Florence. The top floor of the building is filled with many of the 4,800 paintings and sculptures that make up the collection. Works include those by Michelangelo, Titian, Leonardo da Vinci, Botticelli and Raphael among many other famous names. 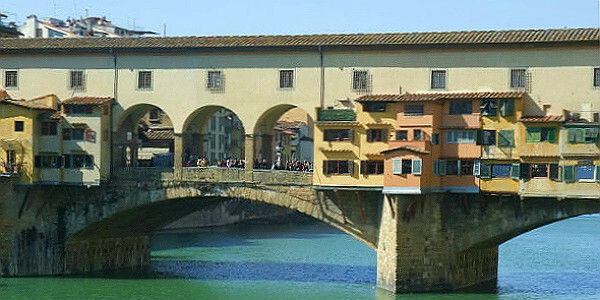 Nearby is the Ponte Vecchio, the oldest bridge on the River Arno, which is covered in shops selling gold jewelry. If you have a chance, opt for a tour of the Uffizi Gallery, which includes a walk through the Ponte Vecchio corridor to the Pitti Palace (another Medici Palace). 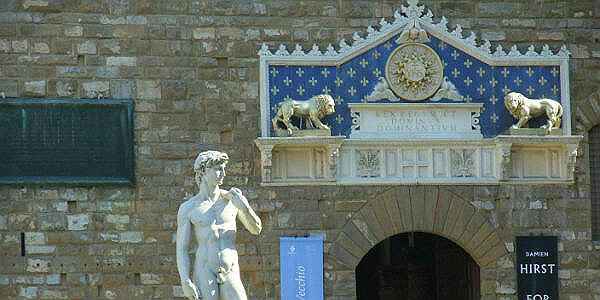 If you only have limited time and are happy to see a copy, Michelangelo’s David can be seen in the nearby Palazzo della Signoria. However the original, along with several others of his works, can be seen at the Galleria dell’Accademia. Hotels with bedrooms offering views of the Duomo cathedral are in high demand. But if money is no object, the Hotel Brunelleschi, part of which is housed in one of the oldest buildings in Florence, is really stylish. If your budget doesn’t stretch that far, The Croce di Malta, near the train station, is great if you want to be within walking distance of everything but not right bang in the center. As Florence tends to get very hot in summer, a benefit is their outdoor swimming pool and lovely roof terrace. Finding a restaurant where the locals eat is always a bonus. Hidden on a back street is the Osteria del Caffe Italiano. The restaurant has several sections, with one part of it specializing in pizzas and another area devoted to local Florentine food. Meat eaters should try the T-bone Florentine steak, grilled or charcoaled; something you can find in almost every local restaurant. But be wary of the price, as it will depend on the size/weight of the steak. Also worth noting are the numerous nibbles offered with your drink at aperitif time. Gilli, with a large outside area, in the Piazza della Repubblica, is one of the city’s long established cafés and a great place for anyone who likes people watching. The Piazza, where a lot of the smart shops are situated, attracts musicians who entertain the crowds, so there is always a lot going on. It is unlikely that you will need public transportation if you are staying in the city. Most areas are pedestrianized, and you will miss out on many sights if you take any form of transport other than your feet. How To Get There: Florence Airport (FLR) is approximately 3 miles from the center of Florence. The cheapest way to get to the city is by taking the Vola in bus, that runs every 30 minutes. Ticket prices are €6 each way or €10 if you purchase a roundtrip ticket. More information regarding area transportation is available here. The airport is serviced by 16 domestic and international airlines, including Air France, Cityjet and SWISS. There are no direct flights from the United States, but you can fly through any major hub in Europe such as London, Paris, Amsterdam and more. Best Time To Visit: May, June, August, September and October are the most popular times of year to visit. However, if you want to avoid the crowds and save yourself some money on airfares and hotels, April and November are the ideal months. Plus, the weather during those two months are typically cooler, in the mid-70s, which is ideal for those who aren’t fans of heat and humidity.